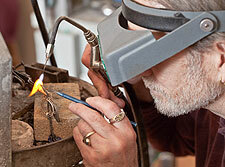 Bob Borter's jewelry making requires careful crafting of materials. 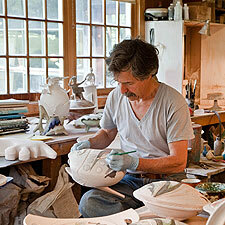 Ken Pick applies the glazes to the design on one of his pottery pieces. The Vermont Center for Photography's new year starts with an exploration of the creative process, both for the artists involved and photographer William Dixon, who shows us where and how the art happens. Dixon's exhibit, "Artists Work Like This," opens at VCP during Brattleboro's Gallery Walk on Friday, January 6, from 5:30 to 8:30 p.m.
Dixon realized a work of art only shows the result of a long process. He says in his artist statement, "This photographic study of nine local artists allows us to enter their studio space, to go back in time to see the tools, raw materials, and processes used in the creation of their art." The nine artists and artisans who allowed Dixon a peek at their working methods are: jewelry artisan Robert Borter, violin maker Douglas Cox, metal sculptor Joseph Fichter, weaver Dena Gartenstein, potters Ken Pick and Stephen Procter, painters Paul Stone and Nancy Storrow, and jazz pianist-composer Eugene Uman. William Dixon has been seriously involved in photography for the last four years. He has been a member of VCP for many years and volunteers his time to help, doing jobs from gallery sitting to hanging exhibits. Originally from Ontario, he has lived in Brattleboro since 1988. 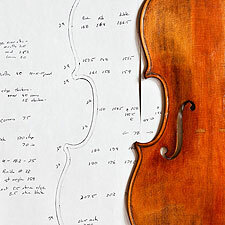 Doug Cox follows precise measurements for his instruments. "Artists Work Like This" continues through January 29, 2012. The Vermont Center for Photography, a non-profit gallery featuring fine art photography, was founded in 1998. The gallery represents photographers from Vermont, New Hampshire, Massachusetts, and New York, promoting a regional community of photographers. 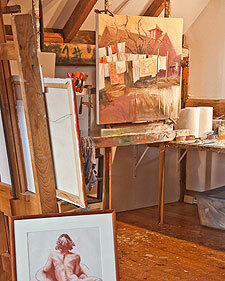 The Gallery is located at 49 Flat Street next to the parking garage in downtown Brattleboro. Gallery hours are Friday, 1 to 6 p.m.; Saturday and Sunday, noon to 5 p.m.; or by appointment. For directions or information, please call (802) 251-6051 or visit the website at www.vcphoto.org.